Development of colon cancer. 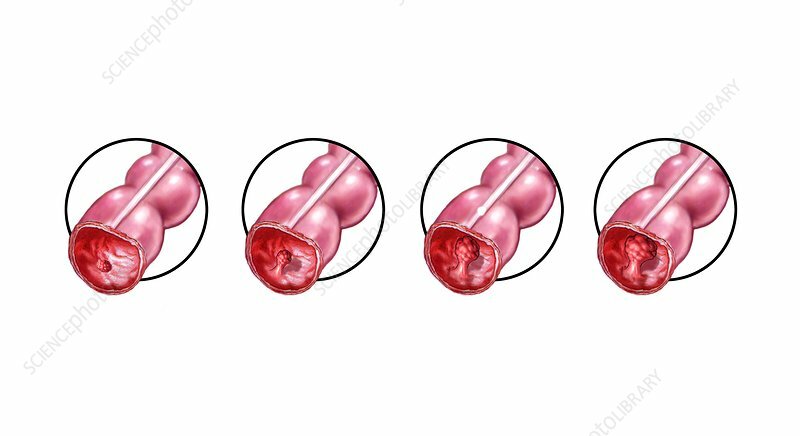 Sequence illustrating the development of colon polyps into a malignant (cancerous) form. Stage 0 (far left) is a small amount of cancer cells in sessile polyp form with no symptoms and no infiltration of the central core. Stage 1 (centre left, three years) is a bigger polyp with the cancer localised to the surface of the colon wall and no symptoms. Stage 2 (centre right, six years) is a very large polyp that has grown outwards and is eating into the wall of the colon, still with no symptoms. Stage 3 (far right, ten years) is a cancerous polyp embedded deep in the colon wall, bleeding and spreading to other parts of the body.